- ATLANTIS I- (9 Days/8 Nights) - 3 Nights Athens, 2 Nights Santorini & 5 Day Cruise. Transfer to the port. Embark on the ship. Sail, (11:00am), to Mykonos, (6:00pm – 11:00pm). We visit two ports. Heraklion, (7:00 – 11:30am) and Santorini. Upon arrival, (4:30pm), to Santorini disembark and transfer to the hotel. All day free to enjoy the “black pearl” of the Aegean. After breakfast transfer to the port to transfer by boat to Athens. 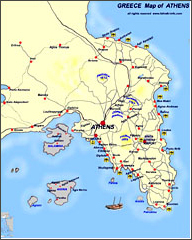 Arrive to the port in Athens and transfer to the hotel, (on your own).